Dr. Jonathan Pitney, later called the "Father of Atlantic City," was concerned about the loss of ships and lives along Absecon Beach, which gave the beach the nickname "the Graveyard Inlet." In the mid-1830's Pitney, who had come to Absecon some 10 years earlier began his efforts to secure a lighthouse for the beach, to warn mariners of its dangerous shore. The schooners LOUISA, Ann, Nile, DUROC ships George Cannon, Frankfort and Gherge's Kahn were among the scores of vessels that met their fates on the shores between the Great and Little Egg Harbors. Finally a Congressional appropriation of $5,000 was voted upon, with the provision that a favorable report should be received by an officer of the Navy Department. In the early 1840's a reluctant Navy Department was ordered to make a study to determine the need or lack of need, for a lighthouse on Absecon Beach. Five thousand dollars was appropriated for the study by Congress. Commodore La Vallette was instructed to investigate and report on the feasibility of the project. He examined records and reports by Dr. Pitney, but recommended not constructing a lighthouse on Absecon Beach. A Joint Resolution (No 6.) on April 17, 1846 requested that New Jersey Senators and Representatives in Congress use their influence to get an appropriation for constructing a lighthouse. However, no further action with regard to building a lighthouse on Absecon Beach was undertaken by the Federal government as a result of the resolution. A Light-House on Absecom Beach, and Bell Buoy outside of Absecom Bar. Referred to the Committee on Commerce, and ordered to be printed. JOINT RESOLUTIONS respecting a Light-House on Absecon Beach, and Bell Buoy outside Absecom Bar. 1. Be it resolved by the Senate and General Assembly of the State of New Jersey, That our senators and representatives in congress be requested to use their influence to obtain a sufficient appropriation for the purpose of constructing a light house and the anchoring of a bell buoy as aforesaid. 2. And be it resolved, That the governor be requested to forward a copy of these resolutions to each of our senators and representatives in congress. On April 16, 1854, the ship POWHATTAN, on a voyage from Harve to New York, and carrying 250 German emigrants and others was driven ashore during a severe Northeast storm. The loss of life was so great that Congress finally gave in, and on December 5, 1854 purchased the land on which the lighthouse would be built, from the Camden and Atlantic Land Company for the sum of $520.00. Work began on the lighthouse in 1856. The surveys and plans for the lighthouse were signed by Lt. George Gordon Meade, who also played a role in the design and construction of Barnegat Lighthouse. Indeed, the stories of the two lighthouses are similar. Both were built to warn ships of very dangerous inlets. They were built within a few years of each other, and to very similar specifications. Both fought extensive battles with erosion. The lighthouse was first lighted January 15, 1857. The engineers in charge of the construction were General Hartman Bache, General George Gordon Meade, and Colonel William F. Raynolds of the Army Corp of Engineers. The Absecon Lighthouse was constructed 700 feet above mean high water level, at what is now Pacific Avenue and Rhode Island Avenue's block. The sea has receded so that the lighthouse now stands over 2 blocks inshore. 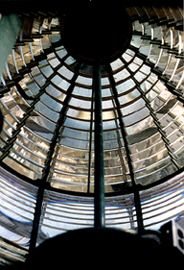 The lighthouse is 167 feet tall to the focal plane of the lens, the equivalent of a sixteen story building. Two hundred twenty eight steps lead visitors to the base of the light platform, and there are 12 more steps to the light-room proper. Its inside diameter is a uniform 10 feet. It was built with 598,634 bricks, and cost a total of $52,187.00 to construct. The lamps were first lighted the night of January 15, 1857. The lamps were of the Funck's design and fueled with mineral oil. The light from these lamps was intensified by a First Order Fixed Fresnel lens. Together they projected a beam of white light that was visible 19-20 miles at sea in the direction of NE by N around SE to SW. The reason for the fixed light was simple. Absecon and Barnegat were very much sister lighthouses, having been built to a similar architectural style. To distinguish them at night they were given different lens. Since Absecon was completed before Barnegat and the machinery necessary for a fixed light is less expensive and elaborate than that of a flashing light, Absecon received the fixed lens. Two years later, when Barnegat was completed, it received a flashing light to distinguish it from its sister to the south. When completed in 1857, the lighthouse was left in its unpainted natural red brick color. It remained in this natural state until 1868 when it received a coating of parge. Later painted in 50 foot bands of white, red and white which helped differentiate it from its white and red neighbor to the north. In 1895, it received orange, black and orange bands which it kept until 1948. One reason for the change was to help the lighthouse stand out from the red brick keeper's house. In 1948, the lighthouse was repainted with white, blue and white bands. In 1963, the lighthouse was repainted again, this time back to white, red and white bands. The first keeper was Daniel Scull who was appointed November 25, 1856. He was paid 600.00 annually or $11.54 a week. The loss of shipping continued however and at least 64 more ocean-going craft foundered on Absecon Beach between 1847-1856. The lighthouse was dimmed July 15, 1933, but there was already an agreement between the Federal Government and Atlantic City to turn the site over to the city for use as a park for $1.00 per year. The lighthouse was built on a plot of ground deeded to the Government by Chaulkley Leeds, Atlantic City's first Mayor. Ownership of the lighthouse was transferred formally to Atlantic City in 1946. 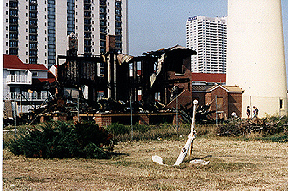 The two original keeper's houses were demolished and the demolition of the nearby Life Saving Station soon followed. Unable to maintain the lighthouse, the city sold it to the State of New Jersey, in 1966. After many years of neglect, the Inlet Public/Private Association (IPPA) raised funds to restore the lighthouse, keeper’s dwelling and grounds. The lighthouse is open to the public. The color of the light remained fixed white until the lighthouse was discontinued on July 11, 1933, although the original illumination was an oil wick lamp it was replaced by an incandescent oil vapor apparatus on June 22, 1910 and used until the lighthouse was electrified on July 1, 1925. The lens is a first order Fresnel, made in France, by P. Sauter and Cie of Paris. It consists of seven panels of glass and one open pane. The focal plane of the light was 167 feet. 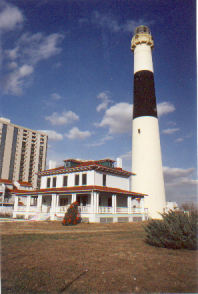 Absecon is the only first order lighthouse in New Jersey that still has its First Order Fresnel Lens on site.